What the competition does not want you to know. 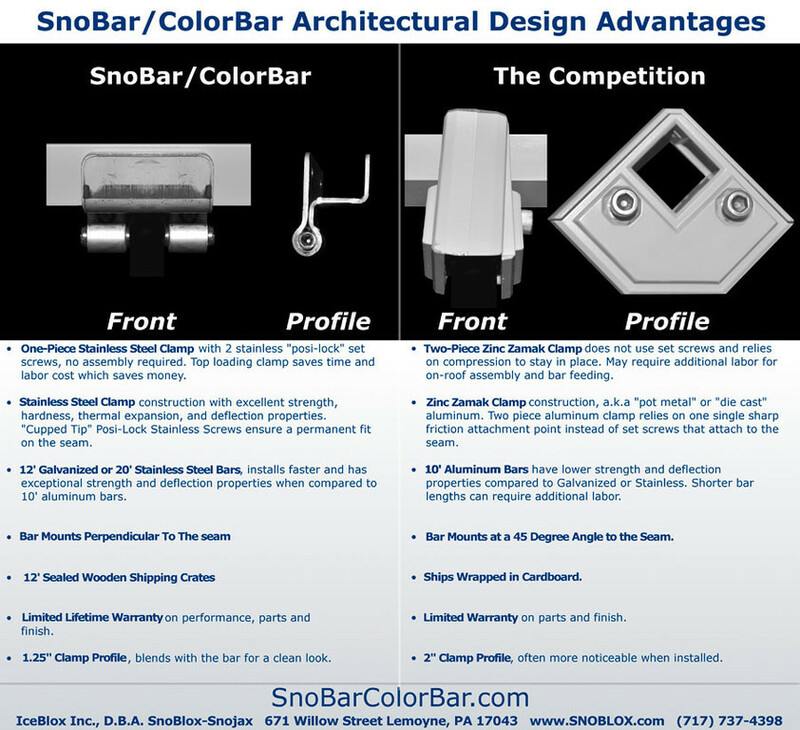 It is not recommended to place the SNOBAR System in isolated areas such as doorways, vents and partial roof areas. Please call for special design considerations in these areas. 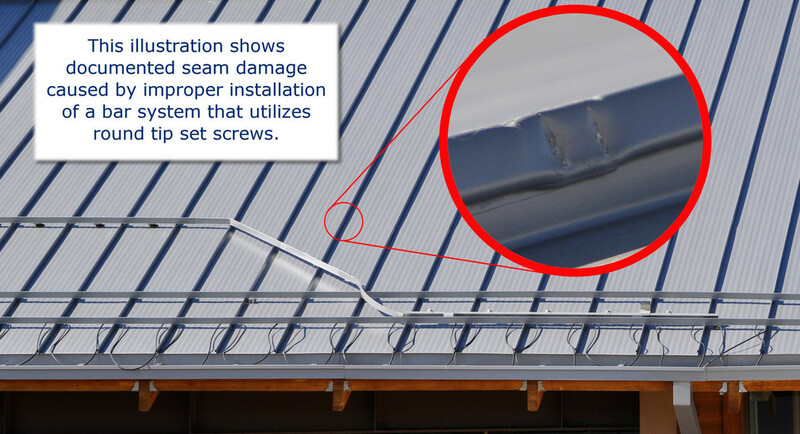 Roof System should be a minimum of 24 gauge steel and have a seam height of at least 1”. It is not recommended to use a clamp type system when the roof panel uses a separate seam cover or batten. Clamp spacing varies depending on seam spacing (12”o.c. up to 42”o.c.). Clamps should be placed at every seam, so that the load is distributed evenly to every roof panel. Designer/Architect, Installer, or Owner of the project should have knowledge of the local snow loads (ground snow load PSF), climatic conditions, roof slope, roof orientation, potential drifting, and roof design prior to installing SNOBAR. 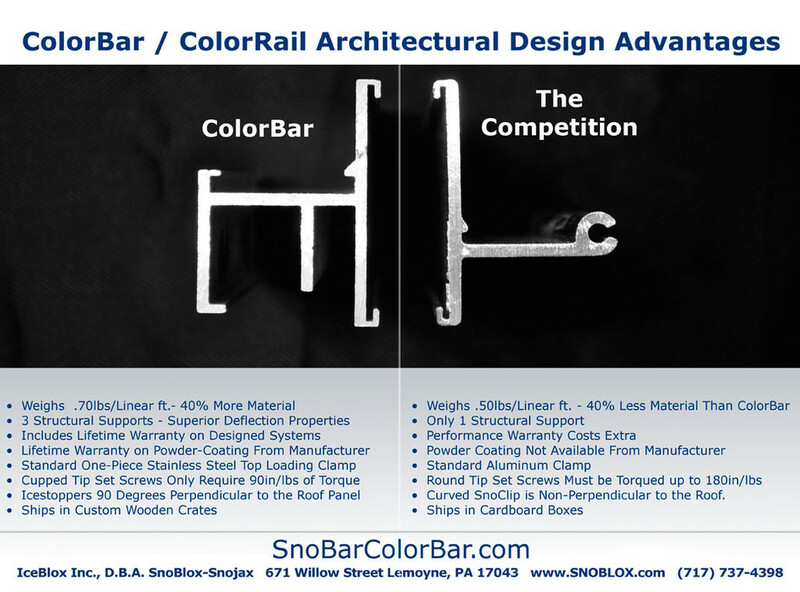 After considering the above factors, determine lineal footage of SNOBAR required based on the length of panels, roof slope, snow loading, and areas needing protection from falling snow. More than one row of SNOBAR may be needed. Call SnoBlox-SnoJax at 1-800-SNOJAX1 for further information. Finally, no matter how much is designed into a system, Mother Nature will throw more at us than we have considered, such as drifting, ice, unusual amounts of snowfall, ect. Owners must be aware of these conditions and when these extremes are reached, snow and ice should be physically removed from the roof. Any snow retention system will not prevent possible wind blown overhangs or cornices. The owner must be aware of these situations and remove them as they occur.